Lets not beat around the borsht. Travelling in Russia is a challenging affair. For a start, you need permission. Visas, obtained at significant cost, and with significant hassle. Russians will argue that visa arrangement are reciprocal, that they have to jump through just as many hoops to visit your country, and they’re right of course. I am told that when Russians apply for visas, it is largely assumed that applicants are either gangsters or hookers. Russians are pragmatic and tough, because Russians have to be. It has ensured their survival since medieval times, in the face of foreign invasions, insane dictators, and truly lousy weather. For things to work here, there is a way, and should you not conform to that way, you pay. Permits are required if you are media, and paperwork must be filed, in triplicate, if you plan on filming outside any public space. If you plan on filming inside, there’s more paperwork (in triplicate). Customer service is practically non-existent, and you’ll be hard pressed to find a smile from a restaurant server, much less assistance from say, a police officer. And then you have the language. It’s like waking up one morning to find that the alphabet you know has been sabotaged by dolphins. Suddenly, an R becomes a P and a C becomes an S and while you might recognize certain characters, they don’t sound like anything you recognize at all. 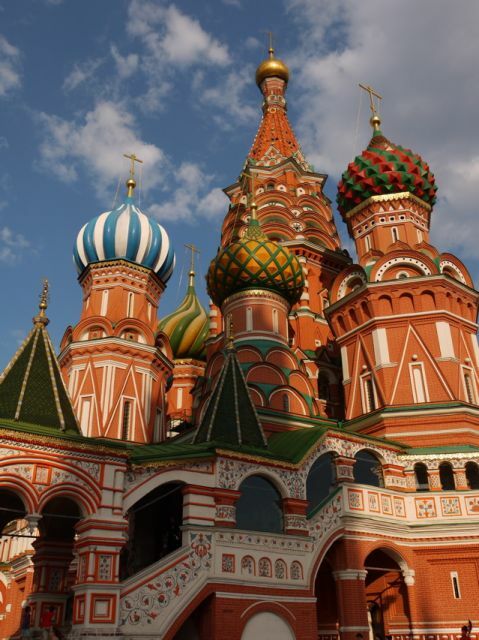 The fact that there are no English signposts, no help for the wayward visitors even in a tourist hotspot like Moscow’s Red Square, can lead you on a treasure hunt for directions. Hampered further by the fact that, in all likelihood, the person you ask for help won’t speak English, and if they did, wouldn’t want to help you anyway. Yes, Russia can be dour, and the steely-eyed glares of locals can be unnerving. Until you get used to it, and realize that you’re in the world’s biggest country, occupying one full eighth of all land on Earth. Stretching across 11 time zones, Russia is not some quirky backward country good for a laugh (like say, Albania). Rather, this is the other country has shaped our modern world, through revolutionary ideas, and the revolutions that they subsequently spawned. Through writers and artists and scientists and soldiers. During the era of the Soviet Union, the paws of the great Russian bear extended so far it eventually had to drop its arms under the sheer strain. Now, after a turbulent hibernation, the bear is rustling from its sleep, opening its eyes, and ready to emerge once more at the top of the food chain. It is prepared to claw and fight its way out, prepared to roar in anger at other predators who might threaten its goals (USA, China). Its’ current leader is famously ruthless, its’ people ambitious and determined, and tourism…tourism…well, that’s simply not as important as mining for gas and oil in the Caucuses. You won’t find glossy government tourist brochures with models having the time of their lives in Moscow. You won’t see bright billboard advertising or sweeping television commercials exclaiming: Visit Russia, it’s like No Place Else on Earth! And yet it is. Like no place else on earth. And that’s why I am back.